The world knows Nostradamus as the man who predicted many major world events. Well 5thRounders, Ngo-stradamus will look to do the same thing, but in the context of the MMA world. 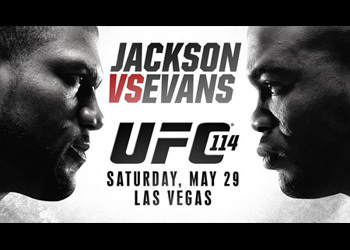 Let’s see if the all-mighty one can make another lucrative set of predictions for Saturday’s highly anticipated “UFC 114: Rampage vs. Evans” event, although he doesn’t appear to be feelin’ any underdogs. Hathaway owns an impeccable 12-0 pro record, with his last three coming inside the Octagon. Although his resume is impressive, his last two contests have resulted in unanimous decision victories – something that will have to change against an aggressive fighter like Sanchez. After posting a respectable 2-1 mark in a brief stint at lightweight, Mr. YES makes his first appearance in the 170-pound division since handing Luigi Fioravanti a 3rdRound TKO loss back in June 2008. Although he fought valiantly against champ BJ Penn in his last outing at UFC 107, Sanchez had his dome split open in the 5thRound when the Hawaiian landed a vicious head kick. While most fans aren’t paying much attention to Russow, he holds a formidable 12-1 record and has finished off eight victims via submission. Clearly, Russow would like to get the scrap to the canvas immediately. Not only would that play to his strengths, but keeps Duffee away from his at the same time. Although Duffee is no slouch on the ground, his ham hock hands can finish fights in the blink of an eye. The 24-year-old has started his MMA career at a perfect 6-0, ending all his fights in knockout fashion. If he’s able to extend his streak to lucky number seven, look for Duffee to face much stiffer competition in his next outing. It wasn’t the fight fans were expecting to see, and apparently the Gambling Gods feel the same way, as they have Little Nog pegged as a 5.5-to-1 favorite to wax Forrest Griffin’s replacement. Nogueira has won six straight contests and looked phenomenal in his 1stRound TKO of Luis Cane at UFC 106. Brilz holds an 18-2-1 mark, and although he has ended eight of his victories via submission, he might not want to test the legitimacy behind Minotoro’s Brazilian Jiu Jitsu black belt. After staring his career a perfect 14-0, Bisping has fallen on some rough times after dropping two of his last three bouts – including his most recent to Wanderlei Silva at UFC 110. Although he’s posted a respectable 4-2 record since dropping to the middleweight division, Bisping’s two blemishes came at the hands of former world champs in Silva and Dan Henderson. Bisping couldn’t have picked a better opponent to right the ship against, as Miller is coming off two consecutive unanimous decision losses. The gritty BJJ specialist started his Octagon career at 3-0, however he could find his head on the chopping block if he were to lose his third straight. I don’t really know if there’s much more to be said about this beef than what’s already come out of the bitter rivals’ mouths. The verbal assaults have covered everything from stanky breath to the stanky-leg, but it’s finally time for the yapping to stop and the fireworks to begin. The longer this scrap goes on, the more it will favor Rashad. If Evans were to become the light heavyweight top contender, Ngo-stradamus believes it will be via a Georges St-Pierre-esque performance.